Fishing on Norfork Lake in the scenic Arkansas Ozark Mountains is unforgettable. Wife, daughter, grandson or neighbor. During the winter, the fish are scattered at all depths and can be found any time of day. Black bass can be found in shallow water early and late in the day. Crank baits, spinner baits, and jerk baits work well when they are feeding shallow. You will also find bass on sunken brush piles 30- 50 ft down. Vertical jigging with a spoon or live bait both work well. 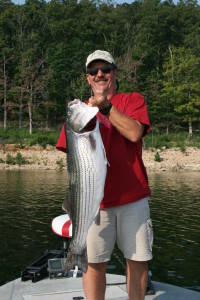 Striped, hybrid and white bass can be found feeding on the bottom from 25 – 50 ft or suspended in deep water (40-60 ft). Vertical jigging works great when you find a school of fish or large, live shiners will do the trick. 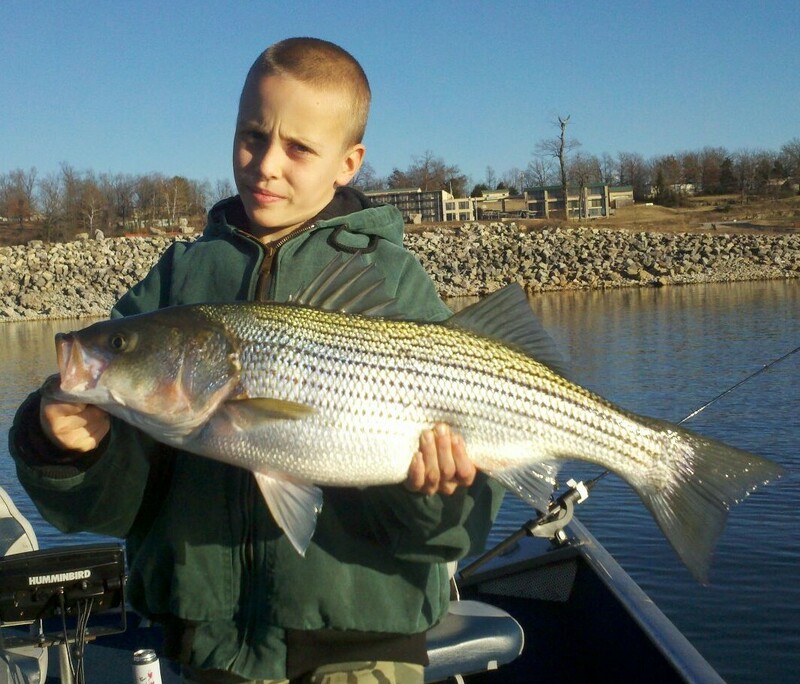 Winter is a great time of year to catch that trophy striper. Crappie will be in, or suspended over sunken brush piles in 30-50 feet of water. Live crappie minnows on a slip bobber or a small grub tipped with a live minnow works great. Remember, slow your presentation during the winter months. On Norfork Lake in the fall you will find the fish feeding heavily and very aggressively while they get ready for winter. Black bass will mainly be found in deeper water 20- 40 feet down. Work the sunken brush piles and ledges along deep bluff lines. Texas or Carolina rigged plastics or a jig and pig both work great. Change your speed of retrieval to find what works best. Striped, hybrid and white bass will be in large schools. They can be found anywhere from 30-50 feet, usually feeding on the bottom. Vertical jigging with a spoon or live thread fin and gizzard shad are the baits of choice. The larger baits seem to work the best until the water cools. 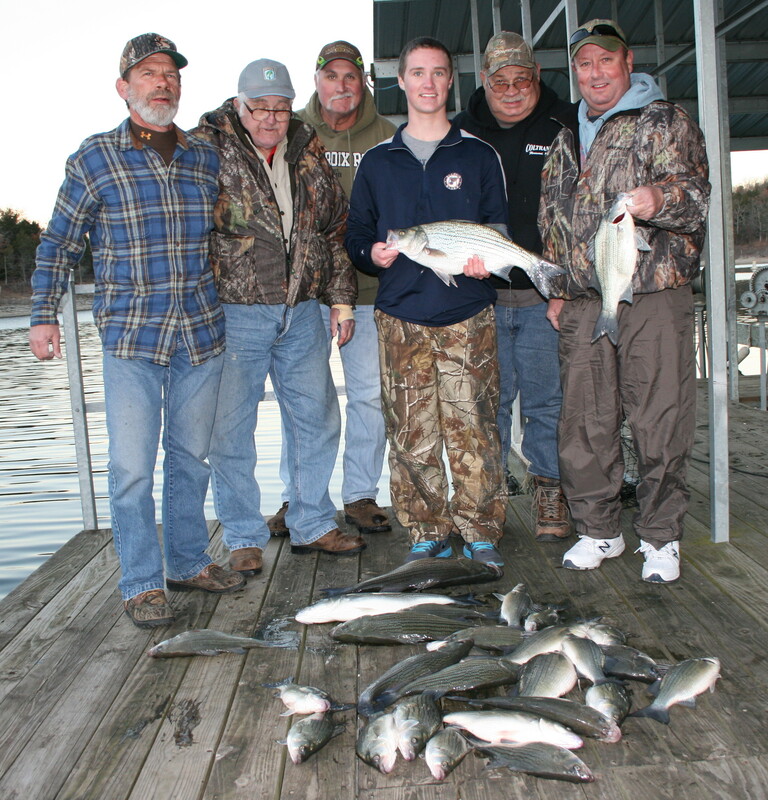 Crappie will start deep in the warmer months then start to come up as the water cools. Look for them suspended over sunken brush piles. Live bait works the best, but try small spinners for the crappie. The warmer months call for predominantly deep water fishing on Norfork Lake. Black bass is the exception to the rule. They will still be chasing shad to the surface early and late in the day then going deep to sunken brush. Top water baits and plastic worms work well. As the sun comes up start jigging over brush or throw a jig and pig. Walleye will be hanging around the brush piles and also in 30-40 feet water off of deep bluff lines. Vertical jig around brush piles or drag a crawler harness along the bottom. Crank baits wil work also as long as you can get them down to the right depth. 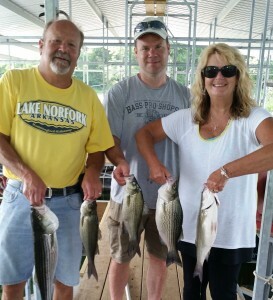 Stripers, hybrid bassand white bass will be schooling and can usually be found in 30-45 feet of water. Vertical jigging with a spoon will work great when you locate the fish or you can fish with live shad. Crappie will be in deep water and will hang out in open water. Look for deep pockets or ledges off of the bluff lines and points. Spring fishing brings with it many different methods of fishing. 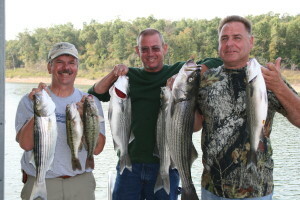 Enjoy the after dark bite, top water fishing and deep water fishing during the spring. Black bass can be found in deep water, along the banks and also chasing shad to the the surface. Spinner baits, crank baits, jerk baits, plastics and top water baits can all be used depending on the time of day and weather conditions. Starting in early spring, striped bass, hybrid bass and walleye can be caught close to the shoreline after dark. Use a suspending rogue, cast to the shore, retrieve very slowly and then hang on! Early in the morning and just before dark throw plastic jerk baits or a top water bait or live thread fin shad. Crappie start their spawn and will be in shallow water or suspended in shallow water over brush. Use a small spinner, crank bait or grub, cast to the baits and use a stop and go retrieval. GREAT TIME OF YEAR TO FISH!